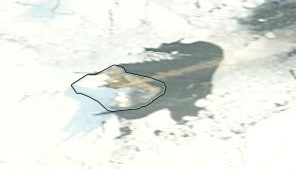 Bristol volcano forms an ice-capped, roughly rectangular island 12x14 km wide and is one of the largest of the South Sandwich Islands chain. Its highest peak is 1100 meters (3,609 feet) above sea level. Although very active, it is one of the least studied and least known volcanoes in the world due to the remote location. Prior to its most recent eruption in 2016, detected on satellite imagery, the only other known eruption of Bristol Island occurred in 1956. The eruption on the remote island continues. Recent satellite images show increased ash emissions as well as two dark stripes that likely are newly erupted lava flows to the west and northwest from Mount Sourabaya volcano.